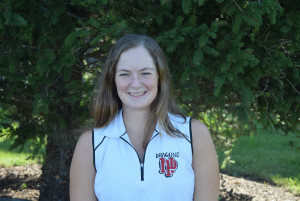 The New Palestine girls golf team posted a Monday victory over Pendleton Heights. The Dragons won 202-208 at Hawk’s Tail. Mackenzi Black led the Dragons with a 46. Rachel Purnell followed with a 51. Izzy Gray shot 52 and Regina Olsen 53 in the match. The Dragons (11-3) are next in action Tuesday at Mt. Vernon. Senior Mackenzi Black shot 46 for the Dragons.